A global Rail industry OEM was preparing a new model of coaches for a new product line. 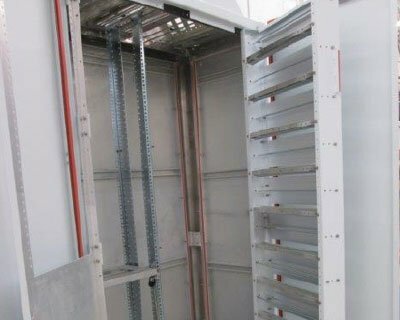 One of the critical components was an electrical cabinet with a welded frame. Internally to the customer, resources were completely consumed with final integration and electrical wiring. Externally, the OEM was unable to find a supplier with a Quality System and Welding Expertise that could stand up to their scrutiny. Furthermore, it was difficult to find a California supplier with enough bandwidth to not only produce the pilot order of 17, but offer cost down suggestions and production capacity for an order volume many times larger. PEKO assigned a Program Manager due to the complex nature and strict customer requirements for this assembly. The Program Manager put together a team of qualified manufacturing experts to ensure the program would be a success to ship within 10 weeks. The team included Manufacturing Engineers, Production Planner, Assembly Supervisor, Quality Personnel and Purchasing. This team ensured all necessary steps were taken for success on such a complex build of low to mid volumes. Bill of Materials was reviewed and finalized, component parts released to in-house manufacturing, off-the-shelf items procured, Quality documentation created and more. The Quality team worked closely with the Welding team to ensure all customer requirements were met using the customer specified Quality templates. The assembly team took the welded frames and finished the build by adding sheet metal panels, slides, hinges and other hardware. PEKO used its internal painting capabilities to paint the entire assembly to customer specs without the burden of an external paint supplier. PEKO shipped directly to the customer line from PEKO with zero outside processing. The OEM chose PEKO as an assembly contract manufacturing expert for these cabinets because of our ability to build and populate such a complex product. The customer enjoyed the success of getting on-time cabinets shipped directly to their assembly line. By utilizing a ship-to-line contract manufacturing solution, the customer maximized its internal resources for final system integration. The customer used this pilot production knowledge to ultimately secure the enormous production contract they sought.